I’m seeing bullish signals for Guppy on both the short-term and long-term time frames so I’m hopping in to catch this ongoing uptrend. Here are my long entry levels. The pair is forming a double bottom pattern on its 4-hour chart, indicating that a reversal from the previous downtrend could be in the cards. 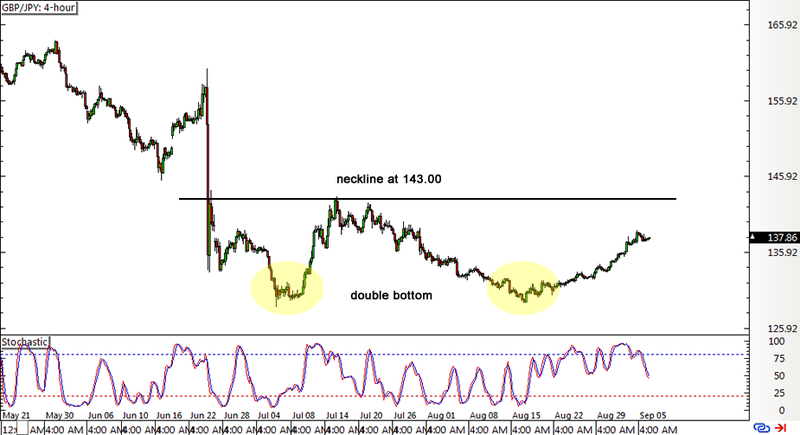 Price has yet to break past the neckline at the 143.00 major psychological resistance before confirming that an uptrend will take place. Zooming in to the 1-hour chart for my potential entry levels, I noticed that the pair is moving above a rising trend line connecting the latest lows of price action. Ideally, I’m hoping for a correction to the trend line around the 50% Fib and 136.00 handle but I already put in a nibbler position at market (137.70) for half my usual risk just to make sure I don’t get left behind. I’ve got a wide stop below the swing low on the 1-hour chart and I’m aiming for the double bottom neckline resistance initially. In case my pullback order doesn’t get triggered, I’ll be ready to add another 0.25% position past the swing high and 139.00 handle then I’ll trail my stop higher. I’m GBP bullish because of the strong PMI readings from the U.K. economy for August, indicating that the manufacturing, construction, and services industries have been able to perform well even with Brexit jitters. This could prevent the BOE from doling out additional stimulus or lowering rates further in their upcoming meetings, allowing pound traders to unwind their short positions. In contrast, BOJ Governor Kuroda has been particularly honest about the need to implement more aggressive easing measures to shore up spending and inflation in Japan. This put the yen in a nonstop dive since mid-August and I think it could have more room to fall as traders price in expectations ahead of the actual BOJ meeting in September 20. 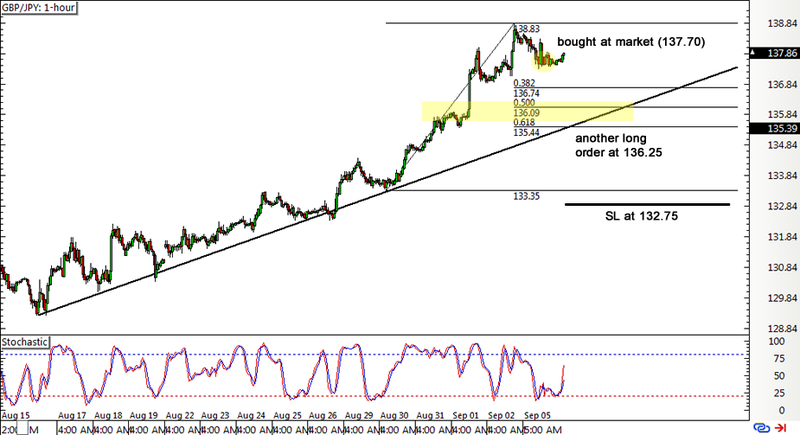 Long GBP/JPY at market 137.70, stop loss at 132.75, profit target at 142.75 for 0.25% risk. Long entry order at 136.25, stop loss at 132.75, profit target at 142.75 or buy stop order at 139.25, stop loss below 61.8% Fib or 134.75, profit target at 142.75 for another 0.25% risk.